worse. She is otherwise healthy with no systemic disease. 2. What is the treatment of this condition? 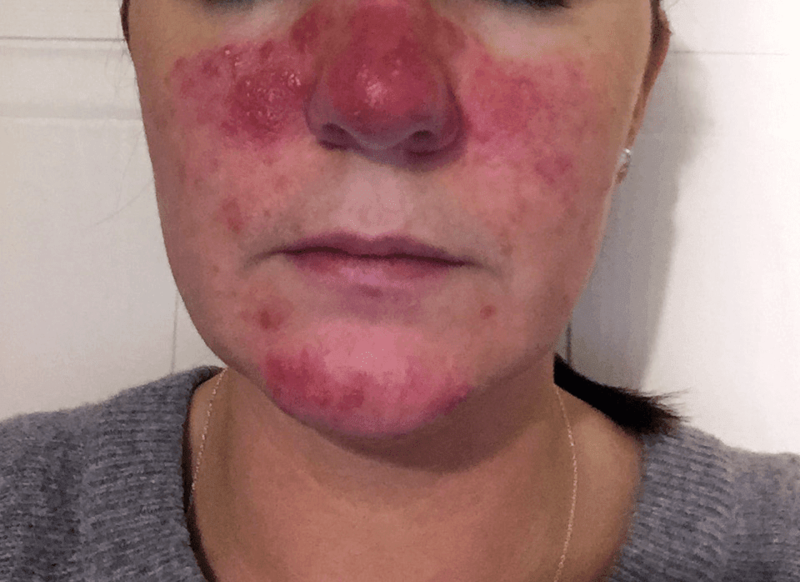 The rash seen in this patient is Rosacea. the nose, cheeks, chin, and forehead. Some people get little bumps and pimples on the red parts of their faces.These signs and symptoms may flare up for a period of weeks to months and then diminish for a while. Rosacea can be mistaken for acne, an allergic reaction or other skin problems. Rosacea can occur in anyone. But it most commonly affects middle-aged women who have fair skin.It is exacerbated by sunlight, hot or spicy foods, and alcohol. Pronounced rosacea may appear as acneiform papules, pustules, or ruddiness. Diagnosis is clinical and there are no specific tests for rosacea. Treatment involves oral tetracycline or doxycycline. Topical metronidazole is also effective for milder cases. Improvement is seen after 3-6 weeks of treatment. The duration of your treatment depends on the type and severity of your symptoms. Recurrence is common. Recent studies have shown the drug brimonidine (Mirvaso) to be effective in reducing redness. It is applied to the skin as a gel. It works by constricting blood vessels. Severe rosacea that doesn't respond to other therapies, may be treated with isotretinoin (Amnesteem, Claravis, others). It's a powerful oral acne drug that also helps clear up acne-like lesions of rosacea. It is contraindicated in during pregnancy as it can cause serious birth defects.